The Campion College 2011 Year Book Committee is desperately seeking your support in purchasing advertisement space for the 2011 year book. Please fill out the form attached and email to one of the email addresses below if you are interested in supporting the school in this venture. 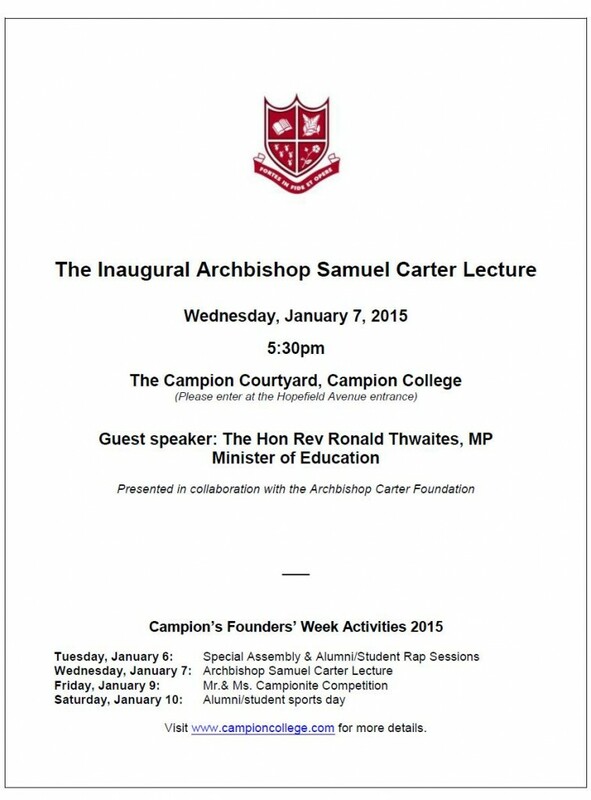 For more information, contact: Christine Messado / Karen Phillips at campion@ccijamaica.com / cmessado@ccijamaica.com. Creative Communication Inc. Ltd. 29 Munroe Road, Kingston 6. 876-977-5020-4 FAX: 977-5448. Please accept my sincere wishes for a blessed, peaceful and prosperous 2011! I write to remind you of some important school policies and procedures, as we work together to provide a safe, orderly and caring environment for our students. Please be reminded that the Nurse’s Station is intended to care for students and staff who have accidents or fall ill at school. The nurse’s role is to assess complaints, render emergency treatment to accident victims and make the appropriate referrals. The Nurse’s Station is not a clinic and therefore parents should not send sick children to school in the hope that they will be treated there. We have had too many cases of very sick children being sent to school, some having been in pain or experiencing other symptoms of distress for days. This practice is dangerous for the child, who should have seen a doctor to ease his/her discomfort, and a threat to the health of other children when the sickness in question is contagious. Please remember also that only the School Nurse or another member of the administrative staff is permitted to contact a parent to collect a sick child from school. I ask that you insist that your child use the appropriate channels if he/she is feeling sick and allow the school nurse to determine whether or not he/she needs to be sent home. It is essential that parents comply with the requirements set out in the Parent Handbook concerning student absence. If your child has to be absent from school for any reason, please ensure that you send a note with him/her on the day of his/her return to school explaining the absence. This is an extremely important area of collaboration between home and school, which if ignored, renders our duty to monitor students almost impossible. The school forbids the use of cellular telephones during school hours and the penalty for a student caught in breach of this rule is immediate confiscation of the phone which will be kept until the end of the term. We recognize, however, that many parents still choose to provide their children with cell phones. We strongly recommend that parents who think it absolutely necessary that their child have a phone at school, consider giving him/her the simplest instrument and not some of the expensive, sophisticated phones we currently see. These phones make targets of their owners, and have capabilities that can be used for academic cheating. We continue to have theft when students leave their things unprotected at the PE Complex. Please insist that your child take a lock to school on the day when he/she has P.E. class or training, so that his/her belongings may be kept safely in the lockers provided at the Complex. Please be reminded of the HSA Consultation Days for parents of students from 1st to 4th Form scheduled for March 24th and 25th. Classes will be suspended for those two days and a schedule will be sent out by mid-March giving a detailed schedule for the Consultation Days.